West Midlands Api wenuwen Api Committee Show Gratitude to Defence Advisor Brigadier Prasad Samarasinghe. The Paragon Hotel, Birmingham , was the venue for an appreciation lunch on 1 March 2009, organized by Mr Shantha Perera and hosted by Mr Lucian Wijesinghe. The host warmly welcomed the guests, thanking Brig. Samarasinghe for his dedication to the Sri Lankan security forces and Sri Lankan diaspora in the UK during his tenure here. The host gave special mention to the great success of the Api wenuwen Api UK programme initiated by Brig. Samarasinghe, that shattered all previous fund raising records of any similar programme of its kind outside Sri Lanka. Following a sumptuous lunch, Brig. Samarasinghe thanked the guests for their support and updated them on the current situation in Sri Lanka , requesting all Sri Lankans to be united as one nation and encouraging them to work closely with the High Commission on future campaigns. Mr Perera presented a token of appreciation for Brig. Samarasinghes dedicated service as the defence advisor in the UK . The Sunday lunch was well attended by guests from London , Birmingham and Manchester . Patriotic Sri Lankan expatriates in Toronto contributed a sum of C$ 4,100 to the Api Wenuven Api fund of the Ministry of Defence for the welfare of war heroes recently. The Consulate General in Toronto, Mr. Bandula Jayasekara along with the patriotic Sri Lankans in Toronto initiated the programme with the collected sum credited to the Api Wenuven Api fund to buy foot spray/foot powder for the valiant armed forces who are now forcing into the last LTTE foothold in Mullaittivu. Mr. Bandula Jayasekara, speaking to defence.lk said that the Sri Lankan expacts are now rallying in numbers to assist the security forces as they battle to end the scourge of terrorism in Sri Lanka. "The expatriates have pledged to support the Api Wenuven Api fund of the Ministry of Defence and other projects initiated by the Ministry for the welfare of the security forces", he further said. Muslims, Tamils, Sinhalese, Burghers and Malays living in Toronto while expressing solidarity with the efforts made to eradicate terrorism from Sri Lanka also pledged to collect over C$ 10,000 for the Api Wenuven Api fund. Ananda college Old Anandian's 97 group has donated medical equipments and a few other items for the use of war heroes yesterday, 24 February. Two suction machines, two stretcher trolleys and a wheel chair were officially handed over to the chairperson of the Defence Ministry's Seva Vanitha Unit (SVU), Mrs. Ioma Rajapaksa by the representatives of old Anandian's 97 group, at the Defence Ministry auditorium. The received items were handed over to Commanding Officer of the Military Hospital, Colonel K.P. Sumanapala at the same occasion by the chairperson of the SVU. A few members of the ministry's Seva Vanitha Unit were also present at the occasion. Sri Lanka Telecom Mobitel (Pvt) Ltd has made a donation worth of 550,000 rupees for the "Api Wenuwen Api" housing fund last Friday, 20 February. The whole staff of the Mobitel (Pvt) Ltd has contributed for the donation and it was officially handed over to Secretary Defence by Chairperson of the Sri Lanka Telecom, Mrs Leisha De Silva Chandrasena at the secretary's office. The "Api Wenuwn Api" (We for ourselves) fund, which is maintained by the Defence Ministry, facilitates Api Wenuwen Api housing project aimed at building 50000 houses for the members of the armed forces.The first phase of housing project is presently underway at Ipalogama in the Anuradhapura district. Construction works of 1620 houses have already been completed. A house built under this project costs 2.4 million rupees out of which 1 million is provided by the government while the rest is expected to be found through donations. The houses will be given to the security forces, personnel at a cost of 800,000 rupees each. 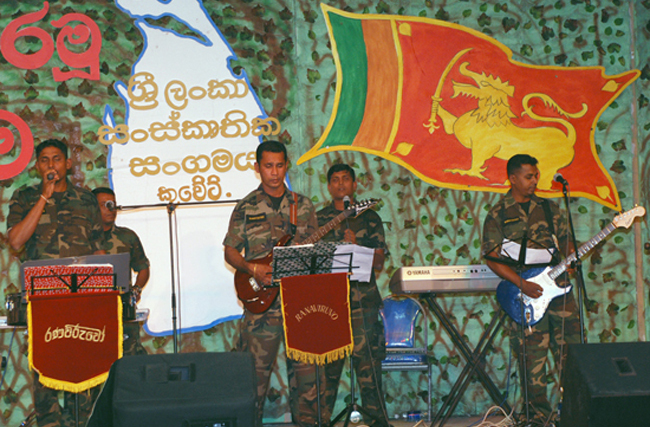 As part of the 61st Independence Day celebrations in Kuwait, the Sri Lanka Cultural Association in collaboration with the Embassy of Sri Lanka in Kuwait organized the "Ranaviru Pranama" Musical Show at Handball Association Auditorium in Kuwait on 6th February in aid of "Ranaviru" Relief Fund of the Ministry of Defence. The Army Ranaviru Troupe which comprised of its founder, Lieutenant Colonel Rajitha Ampemohotti together with 11 other talented servicemen were specially flown in to Kuwait for the show with the courtesy of Sri Lankan airlines. The auditorium was packed with a large number of Sri Lankans well over 800 belonging to all communities. As the troupe arrived at the venue, the enthusiastic crowd gave them a rousing welcome. During the 4 - hour long performance, the troupe thrilled the audience with their superb display of talents in singing and rhythm. The students from the Sri Lanka school in Kuwait performed several cultural items to the delight of the audience. Among the invitees were Sri Lankan Ambassador H.E Sarath Dissanayake, Sri Lankan Airline Manager, Mr. Fayaz Thaha, members of Sri Lankan Associations, leading businessmen, sponsors, well-wishers etc. The evening began with the lighting of the oil lamp followed by the observance of two minutes' silence in memory of the fallen heroes who scarified their life and limb for the unity and territorial integrity of Sri Lanka. In his welcome speech Mr. Gamini Wijeratne, President of the Sri Lanka Cultural Association thanked all those who helped to make this event possible and contributed for the "Ranaviru" Relief Fund. Sri Lankan Ambassador H.E Sarath Dissanayake, the Chief Guest in his speech appealed to all Sri Lankans in Kuwait to support the Government's efforts to usher in peace and harmony for all Sri Lankans. Mr. Ali Mohamed Iqbal, the Secretary of the Association proposed the vote of thanks. A significant feature of the evening was the voluntary contributions extended by Sri Lankans in the audience to the "Ranaviru" Relief Fund which included a contribution of Rs. 1 million by Mr. Zainul Abdeen Mohammed,President and members of the Sri Lankan Manpower Association in Kuwait. A sum of over Rs. 3 million was raised in aid of the Sri Lanka Ranaviru Relief Fund.In a communiqué released the Sri Lanka Cultural Association in Kuwait said that, "the performance staged by the Army Ranaviru Troupe will be remembered by all as a rare feat and a lifetime experience at a time the armed forces are on the threshold of uniting the country and paving way for lasting peace and unity". Sri Lankan expatriates in Bermuda showing their gratitude for the war heroes of armed forces have made a financial donation for the "Api Wenuwen Api" housing project this morning, 16 February. Sum of SLR 290,000.00 collected from Sri Lankans in Bermuda was handed over to the Secretary Defence by Mr Namindra Kudaliyanage, a representative of Sri Lankans in Bermuda, at the secretary's office. Mr Ahamed Ishak Branudeen representing the Sri Lankans in Bermuda was also present at the occasion. 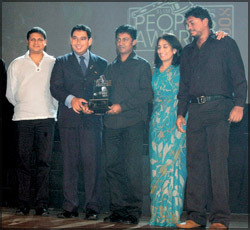 The Api Wenuwen Api campaign created by Triad resonated once again as the number 1 advertisement in the minds of Sri Lankans at the SLIM Nielsen People's Awards 2008. The "Diriya Apata Pudana" advertisement was voted the People's Advertisement of the Year at the awards ceremony held on October 9. This was the second consecutive year that Triad walked away with the top advertising award for the year. 'Diriya Apata Pudana' formed the second stage of the Api Wenuwen Api campaign, calling for contributions from the public towards building homes for those fighting for our motherland. The campaign has had an astounding response from Sri Lankans here and abroad. A member of the Triad Team said, "we are immensely proud to have been a stakeholder in the Api Wenuwen Api campaign; this was our way of humbly giving back to those who have given us so much. This award is proof of the patriotism and national-mindedness of Sri Lankans from all walks of life; the advertisement enabled them to connect emotionally with the sons and daughters defending our nation. It is evident in the response to the campaign that people have shared, integrated and participated in the communication to support, recognise and appreciate the armed forces, at this crucial juncture." The campaign was created by Triad, adjudged No.1 for three consecutive years at National Awards, The Chillies. People's Awards is conducted by the Sri Lanka Institute of Marketing in association with Nielsen International to pick the country's most preferred personalities and brands. The awards are the result of extensive research carried out by Nielsen from January to May. Sri Lankan expatriate workers of the 'Tropic Neeta' apparel firm in Mauritius have made a donation worth of Rs. 571,300 to the 'Api Wenu Wen Api' project. 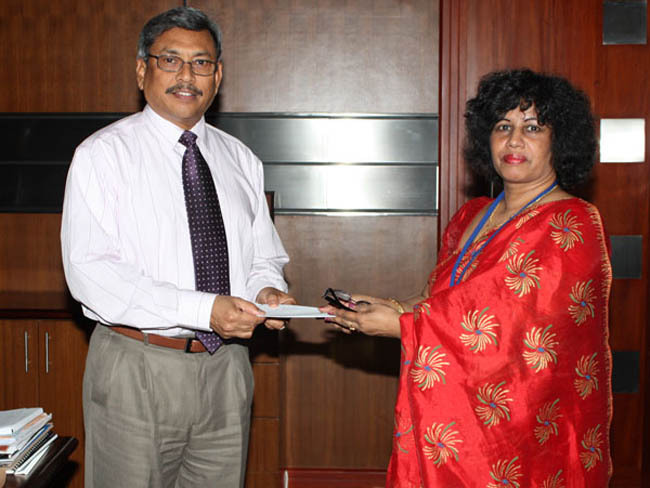 The cash cheque was received by the Secretary Defence Mr. Gotabaya Rajapaksa from representatives of 'Tropic Neeta', during a charm event held at the Ministry premises on February 2006. The occasion was also graced by the Foreign Employment Promotion and Welfare Minister and Defence Spokesman Keheliya Rambukwella. The 'Api Wenu Wen Api' program is a fund raising project initiated by the Ministry of Defence for the construction of 50,000 houses for security forces personnel. Mrs. Yamuna De Silva an English teacher working in Sydney Australia, has made a donation worth of Aus $ 2000 to the 'Api Wenuven Api' fund. The cash cheque for the donation was received by Secretary Defence Mr. Gotabaya Rajapaksa at the Ministry of Defence premises on February 06th. Defence officials are of the view that such an example would inspire others especially, expatriate Sri Lankans living overseas - to make similar contributions towards the fund. Mr. Ananda M. Samarasinghe was also present at the occasion. Copyright � 2014 www.apiwenuwenapi.com. All rights reserved.